So I was getting ready for my ice cream party and Kevin reminded me that he has a diabetic friend coming to the party. Out of my thirty-some flavors, I had none that were sugar-free. (As my friend Lisa watches me type, she says, rightly so, "Yeah, why would you? Cuz who wants sugar-free ice cream?") She should go ask Alice. Alice is Kevin's diabetic friend. Anyway, this sparked something in my head that reminded me I had wanted to try making ice cream with Jell-O. 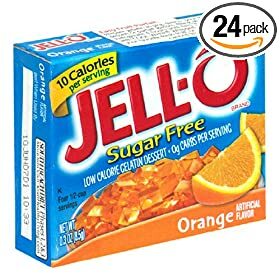 So I went out and bought sugar-free jello, used one og my recipes but replaced the sugar with Jell-O, made some adjustments to keep it from tasting too aspertamey, and put it in the fridge to cool. I won't bore you with the details because it didn't work. I don't really know why I thought this would work and didn't think about the fact that it would jell as gelatin does, but it might be the thirty flavors I had made in a period of weeks and my head wasn't on straight. Buuuuuut, I have heard there are some good Jell-O recipes that use ice cream...maybe we'll feature some of those soon! Cold Stone is advertising two limited edition flavors this Summer that have Jell-o pudding in them. I haven't been over to try them yet. oooh, thanks Janelle! I will have to check it out!